Do you have antique wicker furniture questions? Wondering about your prized wicker heirloom furniture or flea market wicker finds? 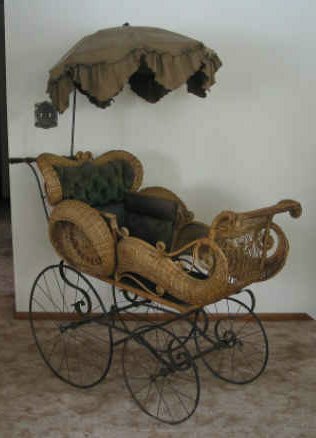 Need to know about the antique or vintage wicker you love and want to preserve? Then you’ve come to the right place for answers. 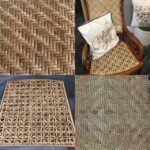 Cathryn shares her knowledge here by answering some of the most common questions about wicker that she’s received over the last 40 years in the wicker restoration business. Enjoy! This page may contain affiliate links since WickerWoman.com is a participant in the Amazon Services LLC Associates Program, an affiliate advertising program designed to provide a means for sites to earn advertising fees by advertising and linking to Amazon.com. When you make a purchase through one of these links, I receive a small compensation without any extra cost to you. 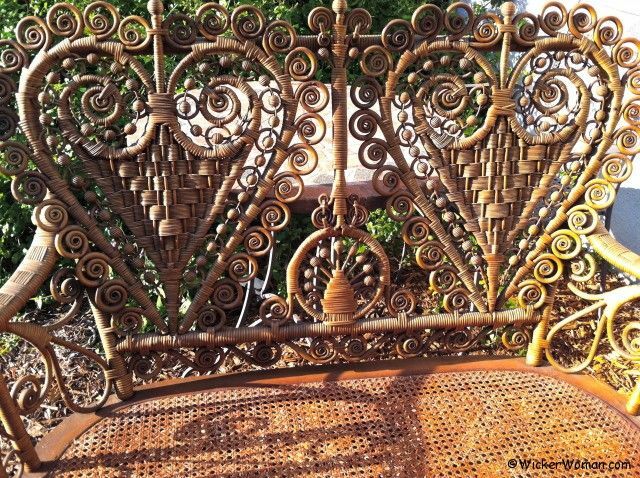 Q: What were antique wicker furniture pieces made out of? A: There are many, many types of materials used in the creation of wicker furniture, but the two main types of wicker materials are “reed” and “paper fibre.” Stick or Pole Rattan, Oriental Seagrass and Bamboo were a few of the others. For a more throughout discussion on the materials used in wicker furniture manufacturing, click on the articles page. Q: What’s the difference between “real” wicker and “paper” wicker? A: They’re both real wicker, but I think what you are referring to is the difference between rattan reedwicker and paper fibre wicker. Reed wicker can snap and break like a twig or stick and is a natural growing material, whereas paper fibre wicker is actually a man-made twisted paper product and can be unraveled. Paper fibre (spelling denotes man-made material, not natural), like the Art Deco era paper wicker pictured above left, was invented in 1904. It is normally the color of a brown paper bag when in its natural unstained or unpainted state, and is the same material used in paper rush seat weaving. It’s twisted and has the diagonal lines somewhat like an old-fashioned barber pole, peppermint stick or rope. 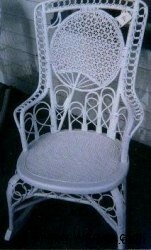 Wicker manufacturing companies either dyed, stained, or painted most pieces before they left the factory. Those that were dyed or stained also had a final clear coat finish of varnish or shellac for protection. Read this article on paper fibre rush for more information about this manufactured process. Q: How do you tell the difference between wicker and cane? A: Generally speaking, there is no such material as “wicker”. Instead, the word refers to the act of weaving chair seats and furniture, or it’s the final end-result product, such as a woven chair, couch, buggy or basket. So, wicker refers to the act of weaving or it is the final woven article made using a variety of materials and is not a material itself. 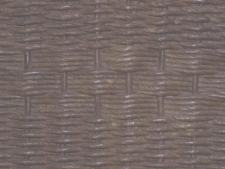 The most popular materials used in the construction of antique wicker furniture were rattan reed and paper fibre rush. Cane is the outer skin or bark of the rattan palm which has been processed into strips and is most often used in weaving seats and backs of wood frame furniture or wrapping joints in whole pole-rattan wicker furniture. Although sometimes cane, rush or splint seat chairs are also referred as “wicker” pieces, they are more correctly referred to by the materials used in the woven seat and the design or pattern. 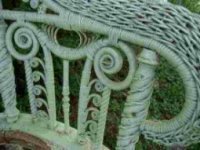 And the Wicker Repair page has more information and pictures on antique totally woven “wicker” furniture, similar to this fancy scroll work and curlicue arm of the antique Victorian “wicker” chair. Q: Is it OK to use my wicker on my deck? A: Yes, it’s OK to use your wicker outside on your deck, but leaving it out there permanently, exposed to all the weather elements, is not a good idea at all. Be sure to bring the wicker furniture in at night and store in a protected area. Although reed wicker, skin-on rattan, and cane bark strands are natural materials that grow in the rain forest areas, they are dead after being harvested. So they can be easily damaged by rain, snow, sunshine, and wind. Skin-on rattan furniture or rattan that still has its bark on and has not been removed in processing, it has a natural glossy finish. This skin too will wear off over time, especially if left outdoors subjected to the elements. The weather elements will eventually rot the fibers of natural wicker furniture and will totally destroy them after a period of time. Also the hardwood frames might warp or rot, or the paint may get damaged and peel or flake off. And no amount of wood water proofing products will prevent this reaction, it will only prolong the life of the piece for a while. In my opinion, you are wasting your money if you try to weather proof your wicker furniture with any of the products on the market right now, other than using Marine varnish and/or paint, which also have their limitations. It’s best not to subject wicker furniture to the weather elements in the first place! Antique wicker furniture can never be replaced, so is not intended for outdoor use! Take care of those valuable antiques and use resin wicker or plastic outdoor wicker , teak , metal , or redwood furniture instead. Or if you really want the wicker look, be sure to buy all-weather wicker or resin wicker which are made to be used outdoors or buy cheap reproduction rattan wicker that’s easily replaced. Q: Can you tell me when my wicker was made and what it’s worth? A: Whether you know it or not, what you are asking for is an appraisal, I am not certified to give appraisals and do not do so. When you ask someone to date your piece or tell you what it’s worth, they are establishing value that you can later use to either sell your piece, put in your will as an heirloom, recover any insurance money from damage claims, or perhaps just have for your own edification. And for any of those reasons, you want the information you receive to be authentic, accurate and documented in case of a challenge. In other words, you want a certified appraisal, tangible proof as to the value of your antique. Anyone can pick a date out of the air and tell you what a piece is worth, but wouldn’t you rather have accurate information, documentation, and irrefutable proof as to the date of manufacture and the current value? Q: Where can I get an appraisal done on my wicker that grandma gave me? A: I highly recommend Richard Saunders in Savannah, Georgia as an antique wicker furniture appraiser. He has been a certified wicker furniture appraiser since 1983, and has written five books on the wicker furniture industry. Keep in mind that appraisals are not done for free, because considerable time, money and effort when into securing the appraisal certification. Your appraiser most likely will do extensive research on your piece and will be able to tell you the approximate date the piece was made, the materials used in construction, possibly the manufacturer, and also give you a value based on the reason you requested the information/appraisal. Expect to pay at least $25 or more, up to a couple of hundred dollars per certified appraised item. Q: Where can I go to compare my wicker with others that are for sale to see what the value might be? Q: Is there a book that lists prices for antique wicker? A: The only fairly current wicker furniture price guide out on the market now is “Wicker Furniture from 1890-1930” by Tim Scott. Be sure to check out all the selections Amazon has to offer on wicker furniture , chair caning and basketry , too. Q: How-to clean wicker furniture? A: Follow my “7 Handy Hints to Care for Your Wicker Furniture”, tip sheet which spells out exactly what to do and not do, to preserve your fine antique wicker heirlooms and flea market finds. Also, read on for more great hints and tips, answers to some of the most frequently asked questions I receive. Q: How-to clean rattan reed wicker furniture? A: You can vacuum frequently to remove any surface dirt, dirt embedded in the weave, or pet hair. Use a damp, clean cloth to remove any stubborn dirt. Or if it’s really dirty and grimy, reed wicker can be successfully cleaned by taking the piece outside and using the water spray hose and light detergent in warm water. Just keep in mind, that any water used might loosen glue joints and/or seep under the paint and cause it to fail later on. Q: How do I clean paper wicker? A: First, use the vacuum cleaner brush attachment to remove dust and surface dirt or use high-powered air in a can to blow the dust out, or you can use a new, clean paint brush to brush loose dirt embedded in the weave. Then use a damp wet cloth with a bit of light detergent added to the water to rub off any stubborn dirt or grime. Do not take these pieces out for an annual water hose down, or use a high-powered water sprayer at home or at the carwash! You might end up with a real mess on your hands because this type of wicker is made out of twisted paper, and water may ruin the paint finish and dissolve the paper wicker underneath, too! Q: How-to refresh faded, dried out rattan reed wicker that has been stained and not painted? A: Well, it’s possible that your unpainted but stained and varnished piece has faded and the top coat of varnish or lacquer has come off, because it was sitting in the sun for an extended period of time. Be sure to do a test area first, in an inconspicuous spot, making sure all products and methods are compatible, acceptable and correct. To freshen faded rattan reed (original finish, stained, but not painted) wicker: Apply a mixture of 1/3 turpentine to 2/3 boiled linseed oil (purchase this from the store, DO NOT boil linseed oil yourself, it’s highly flammable) to the entire area. Use a brush to apply the mixture to get into all the crevices, then let dry for several days, blotting up any remaining oil that raises to the surface with a lint-free cloth or paper towels. Reapply an oil-base stain color to match the existing, and as a final step you can apply two light coats of varnish, lacquer or shellac. Make sure the final finish coat is oil-base, because linseed oil is an oil-base product and is not compatible with water-base products. Make sure you let each coat dry completely before beginning with the next, and don’t let anyone sit on the furniture until it has dried for several days to a week. Q: How do you remove mold and mildew from wicker furniture? A: Mold and mildew on wicker furniture and cane seats can present quite a problem and removal is not always easy, or permanent. First of all, try to avoid this situation by maintaining an even humidity level in the room where the furniture is used and or stored. If you have high humidity, consider using a dehumidifier to protect your furniture and maintain your own comfort level. Storing cane or wicker furniture in a damp or high humidity basement or outside on a porch is just asking for trouble. If you have rattan reed totally woven wicker, not paper fibre, take your piece outside on a warm, sunny, and windy day to clean using a soft scrub brush and a strong solution of bleach in soapy water. Or you can use a bit of ammonia in water–but don’t mix bleach with ammonia, it can be deadly! After the piece is cleaned, rinse well with water and leave out in the shade to dry thoroughly. When the reed wicker dries, it will shrink up a bit and be more firm and sturdy. Don’t allow anyone to sit on the furniture until it has dried for several days, otherwise, the reed wicker strands will stretch out of shape. Removing mold and mildew from cane seat chairs is easier than removing it from totally woven wicker furniture, but the procedure is the same as was mentioned above, except that you only apply the ammonia and water to the cane seat and not on any parts of the wood. Be careful with the ammonia solution because it’s possible the cane may be damaged from it and become brittle. And if your furniture is painted, then be extra careful when using this removal technique, because it might damage the finish, lifting the paint. If after this treatment, you still see little black specks of mold, you might try applying full-strength bleach to each spot, using a small artist’s paintbrush or a Q-tip. Here again, be sure to rinse and dry well and don’t let anyone sit on the piece until completely dry. Sometimes, the black mold spots cannot be removed no matter what you do, but will not be visible on the bottom side of the seat, anyway. Q: How do you remove cat pee or cat urine odor from wicker? A: First of all, you need to determine whether the pieces are made of paper fibre wicker or rattan reed or even skin-on rattan stick wicker (check the explanations of the various materials here on this page and on the articles page). There’s not really a perfect solution to this problem, so you might need to return it to the previous owner and ask for your money back if you just recently purchased the wicker from a private party. About the only solution I have is to either paint the wicker set completely, first using a wood primer like Kilz , which prevents “bleed through” of dark paints and some odors. Go over the whole piece with the primer then give it 2 light final finish coats of oil-base paint. Or you could try going over the whole set with a clear coat of shellac to cover and mask the odor. If your wicker is made of rattan reed and not paper fibre, another treatment you might try would be to wash it using an equal solution of water and white vinegar. Then sprinkle baking soda over the wet area to neutralize the odor. Then let the pieces dry completely and vacuum up the baking soda before sitting on them. Or better yet, check with to see if there are professional cleaners in your area that treat furniture for smoke damage. They might be able to put the furniture in their carbon chambers to extract the offending smell or have another solution to this problem. There are some good pre-mixed enzymatic cleaners on the market that you might also look into. And my old favorite for getting rid of skunk smell from my dogs when they were attacked is the same for getting rid of cat urine odor. ***However, using the following mixture might cause your rattan reed furniture to change colors and bleach it out, since there’s hydrogen peroxide in the solution. So be aware you might have to do some spot painting or staining on your wicker after the odor is removed. First you need to neutralize the urine spot with a solution of white vinegar and a little water. Saturate the area, then let it dry. Leave the solution on for a while until it dries completely, then vacuum up baking soda residue. It’s possible that you will need to repeat this project a second time, so don’t get too hasty in repainting or staining that wicker! Q: How do you paint wicker furniture? compressor sprayer , or paint spray cans. Be sure to do any preparation of the piece before painting, such as removing flaking paint and using a primer coat before applying the paint. For more detailed instructions on painting wicker furniture see the Article called, How-to Paint Wicker Furniture. 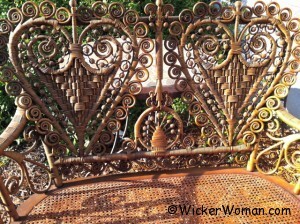 Q: How do I find someone to repair my wicker furniture? 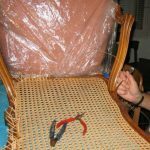 A: Locate an expert near you to repair your wicker furniture or recane your cane chair, by searching the National Furniture Repair Directory™ right here on WickerWoman.com, which lists experts from across the country in the specific areas of their expertise. And if you have a restoration business and want online advertising through WickerWoman.com, go to the Advertise With Us! page and complete the form. Pay for your ad using the handy PayPal buttons or mail a check to The Wicker Woman, using the address found on the Advertise page or Contact page. 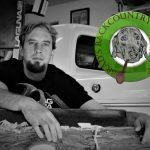 Q: How do you find someone to do chair caning and wicker repair if you don’t have computer access? A: You can look in the Yellow Pages of your phone book under Caning, Chair Caning, Wicker, Wicker Repair, Seat Weaving, Furniture Stripping, or Furniture Repair. But of course, with the volume of cell phone users now, phone books are hard to come by. And many repair experts don’t even have landlines anymore so you can’t look them up in a phone book. You can still check in the many wicker furniture books, where wicker and cane experts are listed in the back of the books, arranged by state and specialty. Richard Saunders has written at least five books, all with experts and suppliers listed in each book and he’s a certified antique wicker furniture appraiser. Ralph & Terry Kovel have written three restoration specialists books for antiques and collectibles in the past. The Wicker Woman business is listed in all three of the Kovel’s early books, (the first was under a different name and published in 1995); the 2003 edition was called Kovel’s Yellow Pages. Take a look for the new editions and other books at www.Kovels.com. If you can’t find experts to repair your furniture the old-fashioned way, then canvas your local antique store owners, furniture strippers, upholstery shops, woodworking shops, cabinet shops, carpenters and your friends or coworkers. Many times caners and wicker repair experts don’t advertise but instead, use word of mouth. You’ll find that most of the antique dealers and furniture strippers know of someone that does quality work, but whether they will share that information with you is another story. A: I’m not in the business of selling cane and basket materials by mail order or over the Internet, and only sell supplies through classes I teach. So, I’ve set up a Cane & Basket Weaving Supplies referral page where you will find over 40 mail order cane and basket supply companies. You can place your order for caning supplies, basketweaving materials, tools and instruction books online or via telephone. When you place your order, be sure to mention you found their ad on the Cane & Basket Supplies page of WickerWoman.com! Q: Where can I buy supplies, instruction books and tools to make repairs myself? Q: What books do you recommend to get more information on antique wicker? A: If you are a wicker lover either a collector or interested in restoring wicker furniture, I recommend adding these books to your own private resource library. Here are my book reviews on a few of these books. 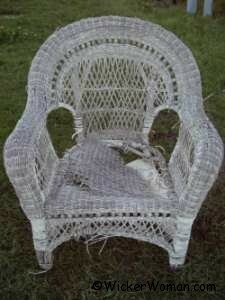 Q: How do I start my own chair caning and wicker repair business? 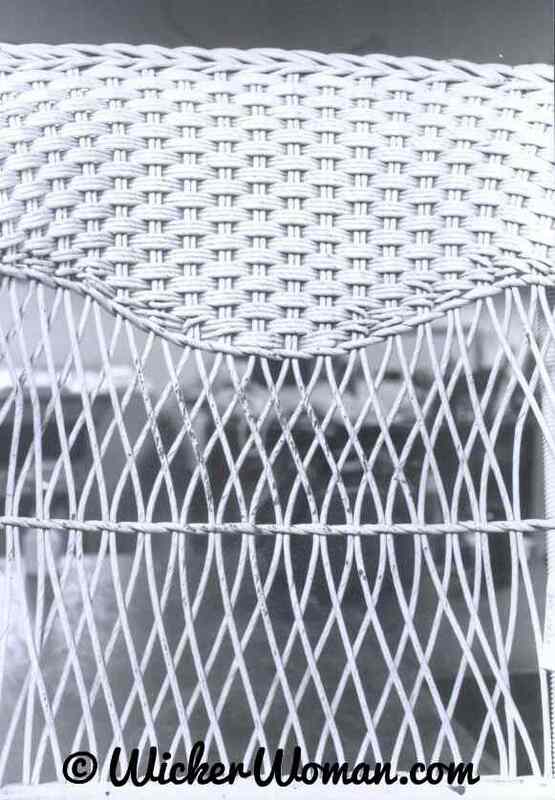 A: If you are already a basketmaker, the transition from basketweaving to wicker restoration is a natural, because the same type of weaving techniques are used in both products. Even if you have no prior weaving experience it is possible to teach yourself, but I would recommend getting some competent instruction from a teacher if possible. 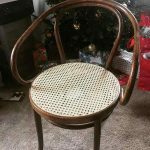 Your best bet would be to try and find a wicker restoration class you could take, or perhaps apprentice with a specialist or at least take private lessons in seatweaving or wicker repair. Also check with your local community education, college level courses, arts & crafts schools, basketry guilds and basket workshops, folk schools, & conventions and ask at woodworking schools and technical schools. You never know who might be offering chair caning or wicker repair classes! Be sure to check out all of the small business & home-based business advice from Barbara Brabec and others for a ton of useful information on beginning your craft business. Then too, you can join us anytime on the Seatweaving, Chair Caning & Wicker Repair Discussion Board Forum for help with questions of any kind or just plain chatting with like-minded weavers! 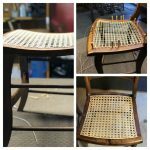 Disclaimer: This page was written by Cathryn Peters based on her own personal experiences and knowledge about the antique wicker and chair caning furniture industry acquired over the last 40+ years of providing chair caning and wicker restoration services. Viewers may follow these directions using their own best judgment and no liability concerning your results is assumed by The Wicker Woman® or Cathryn Peters. We certainly hope you’ve enjoyed all these FREE articles, hints and tip sheets. Thank you for your kind support of this information resource website by donating generously! We hope you’ve enjoyed these wicker furniture questions and answers and will come back often to see additional tips and hints! 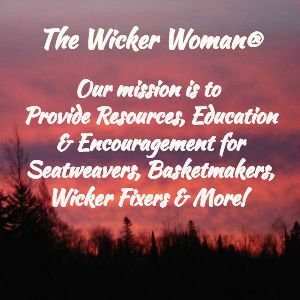 Thank you so much for visiting WickerWoman.com!